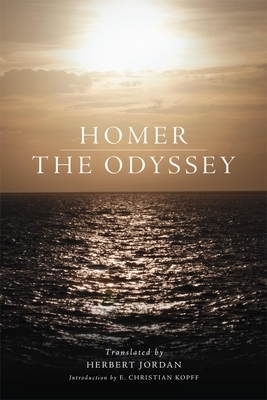 One of the two major ancient Greek epics, Homer's Odyssey, has been a classic of Western Literature for centuries. This new translation into spare, elegant blank verse is certain to attract the same praise and admiration as Herbert Jordan's translation of Homer's Iliad. In keeping with the style of his Iliad, Jordan renders the Odyssey line-for-line in iambic pentameter, a pleasing five-beat meter as used by Shakespeare and by his contemporary George Chapman, the first great translator of Homer into English verse. Jordan deftly pilots Homer's dactyls and extended metaphors, capturing the essence of the poet's meanings while avoiding an overly literal or colloquial style. This edition features maps of the Aegean region and Odysseus' travels, explanatory notes, a pronunciation glossary of nouns, and an index of similes. E. Christian Kopff's introduction parses the Odyssey's meaning and intent, and contextualizes the poem within the larger epic tradition. Readers never tire of the story of Odysseus' return home from the Trojan War. This lively and energetic rendition invites twenty-first-century readers and students of Homer's epic to experience these adventures as if for the first time.